Speaking with Dustin McGladrey, , you'd be surprised to learn that he hasn't always been an enthusiastic champion of Indigenous culture. These days, you can hear Dustin broadcast across Alberta on CFWE FM. On Saturday mornings, he's hosting Conversational Cree - a radio program dedicated to nehiyawewin (Cree language) resurgence and revitalization. He's also the station's afternoon drive host, and you can tune in to hear Dustin on air Monday through Friday from 2 - 6 pm, and on Sundays from 12 - 4 pm (visit http://www.cfweradio.ca/ to listen live from outside of Alberta). But when Dustin was younger, negative ideas about Indigenous people from peers made it difficult for him to fully embrace this part of his identity. While he first came to UNYA to conduct a job search, he soon found new activities and connections that kept him coming back regularly. Having a positive space with opportunities to participate in cultural activities opened the doors to culture for Dustin. Dustin speaks fondly of UNYA and its positive influence on him: "They give you what you need. You get integrated into this community of fantastic positivity and growth. It's impossible not to grow yourself." Staff who saw Dustin grow and excel throughout his time at UNYA say that it was his own initiative and dedication that allowed him to excel and develop his natural skills through the opportunities offered to him. Marie, coordinator of the Overly Creative Minds Program at the time, says that Dustin always came in with intention and applied what he'd been learning. When youth like Dustin come to programs with dedication and specific goals, and are vocal about their needs, their influence on programming ripples outward to create opportunities for others. During his time at UNYA, Dustin suggested having an Elder visit, which is now part of regular programming. He inspired UNYA to acquire professional recording equipment for the Overly Creative Minds studio, which has opened the door for other youth who now record and edit their own songs and podcasts. Radio has allowed Dustin to share his incredible passion about culture with others and be a strong, positive role model for youth. He's in his element working in radio: He's articulate, a natural storyteller with a good sense of humour and incredible knowledge about strong Indigenous voices. Dustin was able to apply his natural leadership abilities and positive energy to grow from youth participant, to volunteer, to program assistant at UNYA, before leaving Vancouver to pursue a career in broadcasting. 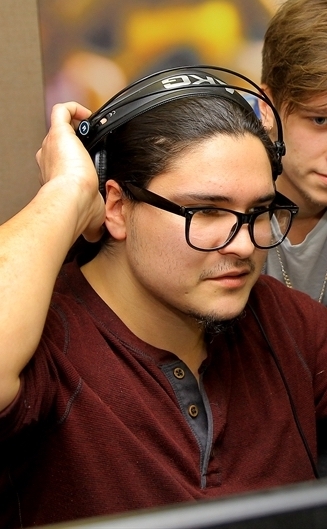 Studying Radio Broadcasting and Communication at BCIT led him to produce Journeys, a documentary radio show on Canada First Nations Radio (CFNR) focusing on current issues affecting First Nations people and on showcasing Canadian Indigenous musical artists and bands. Dustin now works for the Aboriginal Multi Media Society, producing and hosting on CFWE 98.5 FM in Edmonton.